A guide to getting the most out of Perl covers such topics as productivity hacks, user interaction, data munging, working with modules, object hacks, and debugging. With more than a million dedicated programmers, Perl has proven to be the best computing language for the latest trends in computing and business. While other languages have stagnated, Perl remains fresh, thanks to its community-based development model, which encourages the sharing of information among users. This tradition of knowledge-sharing allows developers to find answers to almost any Perl question they can dream up. And you can find many of those answers right here in Perl Hacks. 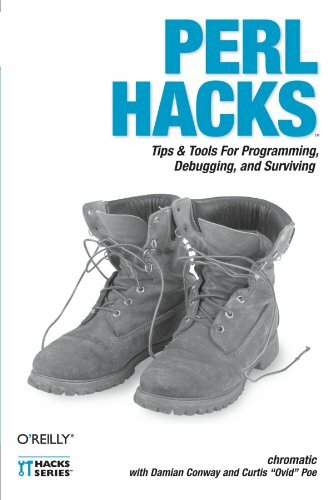 Like all books in O'Reilly's Hacks Series, Perl Hacks appeals to a variety of programmers, whether you're an experienced developer or a dabbler who simply enjoys exploring technology. Each hack is a short lesson--some are practical exercises that teach you essential skills, while others merely illustrate some of the fun things that Perl can do. Most hacks have two parts: a direct answer to the immediate problem you need to solve right now and a deeper, subtler technique that you can adapt to other situations. Learn how to add CPAN shortcuts to the Firefox web browser, read files backwards, write graphical games in Perl, and much more. Whether you're a newcomer or an expert, you'll find great value in Perl Hacks, the only Perl guide that offers somethinguseful and fun for everyone. About: A guide to getting the most out of Perl covers such topics as productivity hacks, user interaction, data munging, working with modules, object hacks, and debugging.